With the press of a button on the key fob, the driver’s side and rear doors of Chris Sauerbaum’s pearly white GMC extended-cab pickup truck popped open and began to move outward. About a minute later, the door was in position — about four feet from the truck body — and the wheelchair lift was on the ground. Sauerbaum, 33, of York City, maneuvered himself into position for the ride into the driver’s compartment. Another minute or so later, Sauerbaum, who has a physical disability resulting from chronic inflammatory polyneuropathy, was in position behind the steering wheel, joysticks in hand and ready to roll. The truck, especially when the doors open, is a head-turner. “You might as well be driving a Lamborghini,” Sauerbaum said. But driving anything is what makes him happy. It’s something he’s wanted to do for more than a decade. Driver: The journey to getting Sauerbaum behind the wheel of his own car started 11 years ago. The process has cost thousands of dollars and borne numerous setbacks. He originally bought a Chrysler PT Cruiser with hopes of converting it to work with his disabilities. But it couldn’t be outfitted with the needed joystick controls. Finally in 2013, Sauerbaum and wife Heather Sloat started an appeal for donations to raise money for a down payment on the pickup truck. They raised the needed $10,000, including a $2,500 donation from Oletowne Jewelers, 2157 White St. in West Manchester Township, and made the down payment on the GMC Sierra pickup a few months ago. The truck was then sent off to undergo a $91,000 conversion, which was covered by the state Office of Vocational Rehabilitation, and the family of four finally took delivery of it about three weeks ago. “Think of it as a big (remote controlled) car. An 8,000 pound R/C car,” Sauerbaum said of the added electronics that allow him to operate the truck. The pickup features two joysticks in the driver’s compartment. One allows him to feed the engine gas and to brake, and the other controls steering. It took Sauerbaum a week and a half of training to get ready for the road. Easier life: Driving not only gives Sauerbaum the freedom of the road but also frees up Sloat’s day. In the past, she’d have to drive him to work, racking up 80 miles on the odometer each day, she said. Now that Sauerbaum has his truck, he and Sloat want to help others in similar situations get behind the wheel. They are working to gain 501(c)(3) status for Drive for Independence, a nonprofit organization they are starting to help people with disabilities navigate the process of getting a converted car that meets their needs. “It’s just one piece of the puzzle to get people to work,” Sloat said. 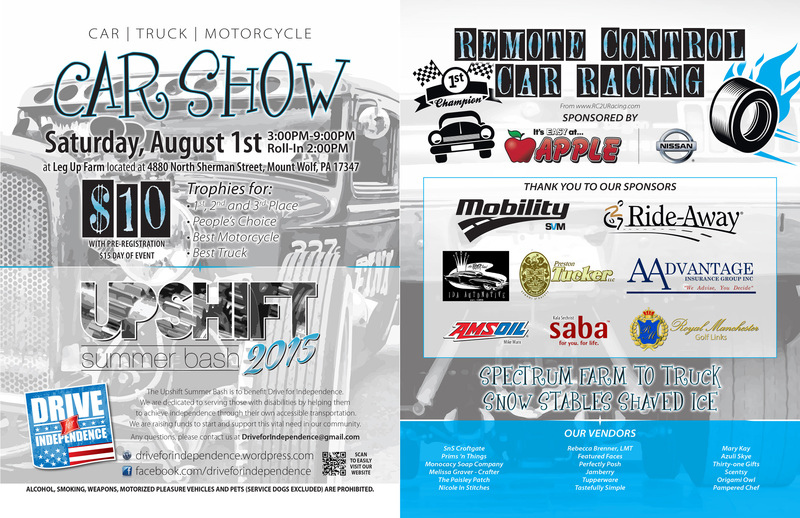 The truck also met with approval during a recent car show in Mountville, Lancaster County. It took home first place in the street truck/SUV class at the Turn Up the Pink Car Show, Sloat said. Sauerbaum and Sloat’s two 6-year-old boys, Tucker and Harley Sauerbaum, were anxiously awaiting their ride in the truck. But first, they needed new car seats. Harley wasn’t always so keen on the truck. Sloat and Sauerbaum showed the boys a video of Sauerbaum testing out a similar truck. As the doors slid open and Sauerbaum prepared to get in, Harley got a horrified look on his face and started crying. “Harley said, ‘Why is that Transformer eating Daddy? '” Sloat said. For more information about Drive for Independence, visit http://www.driveforindependence.wordpress.com. — Reach Greg Gross at ggross@yorkdispatch.com. The last week and a half we were in Johnstown. It was quite a different experience to be kid free for that long since the boys were born. We also had to adjust to a different schedule for that time but we managed. Getting up at 6 in the morning instead of heading to bead at that time was a little tough but we managed. Chris went out driving about 4-5 hours everyday for the most part. He drove some crazy roads most of the time that were snow covered. He was learning to drive on very sensitive equipment so this is a pretty good indicator he can definitely handle the equipment he needs! Let alone it wasn’t set up specifically for him. He had to make do with what was available. Here’s a map to give a idea of what Chris was tackling everyday. The full joystick was a little too finicky for him so they decided on gas/brake lever and steering on the joystick. The T handle on the gas/brake set-up wasn’t working well for him so Chris suggested a vertical handle instead. EMC doesn’t make a vertical handle surprisingly so they had to rig a makeshift stalk for him to use. The joystick was the same thing and has a pretty tiny ball and he had a little issue with that as well so they made another makeshift stalk for it. Once they got everything set up for him he did very well. Tuesday Feb 17th he took his driver’s test to get the additional driving equipment added to his license. He had his license there are just additional requirements for driving via joystick. He is now able to get his truck equipped with EMC joystick steering! We are now waiting for the prescription to go to OVR. Once they have the prescription we will get the go ahead to buy his truck. After we get the truck we will have to choose 3 companies to bid on the work. Once the bid process is over the truck will be dropped of with the bid winning installer. It will first head to Indiana for Mobility SVM to do the floor and lift conversion. It will then most likely head to EMC for wiring up in Maine. Finally it will then come back to the company who won the bid (we’re hoping we can get Ride-Away in Norristown) to finish the installing of EMC equipment, EZ-Lock, and all the finishing touches and we’ll take final delivery. At final delivery Chris will have up to 5 days of additional training on his new truck with the rehabilitation specialist to make sure the truck is set up and working well for him. We still have a bit more of this process to get through but we are headed in the right direction! We’ve been warned it could be a year until we take final delivery. It shouldn’t take that long but we are preparing for the worst and hoping for the very best that it is only at most 6 months! We are ready to begin the planning stages of bringing Drive for Independence to life! We’ve reached our goal and will be getting Chris’s truck soon. We are now ready to begin Drive for Independence. Our mission is to help those with physical disabilities get the accessible transportation they need to reach their life goals. We will be focused on people with the highest level of disabilities and have needs for a higher cost vehicle to be converted. Depending on the situation and needs we may be able to help others with getting low-level hand controls. We will be helping by providing grants to people. In most instances the maximum grant possible will be $10,000.00. We will also be following rules for Pennsylvania OVR in regards to insuring vehicles. If you are using Pennsylvania OVR for your conversion there are rules and regulations you must follow and we will have very similar guidelines. You will not be eligible for another grant from us for at least 10 years and all other funding options must me exhausted before we can consider giving a grant. There are many, many people who need vehicles but we want to be sure the vehicle will be taken care of appropriately and that the person can financially sustain the high price of the converted vehicle. We will be there to direct people on the best options for them and help them navigate funding sources. We want to give people the best opportunity to succeed in life! We are currently working to form a board we need a secretary, several board members and a fundraising committee to be successful with Drive for independence. If you are interested our first meeting will be held Thursday February 26th at 6:30pm at Panera Bread in East York. Please follow the link to the Facebook link and let us know if you will be attending: https://www.facebook.com/events/804259203006295. If you don’t have Facebook and would like to attend please email us at driveforindependence@gmail.com. We look forward to serving our community with Drive For Independence! What’s Next? OVR red tape hoopfest! Plenty of people are curious as to where we go next with getting Chris’s truck. Here is a basic run down of what’s to come. This week we turned in the OVR agreement of what is to happen in the process and turned paper work into the doctor to be filled out so Chris can be re-evaluated (first hoop of red tape) for what hand controls he needs. We are now waiting for OVR to contact us to set up that evaluation. Once that evaluation is completed we have 3 months to purchase a vehicle as that is the length of time the evaluation is good for before you have go around again. OVR then does a bidding process (second hoop of red tape) that we have to go through to determine which company we will work with for the full conversion. The next step would be purchasing the truck. We’ll pick out/order the truck Chris wants and then it will be time for conversion. The truck will first be sent to Mobility SVM in Indiana to do the floor/lift to enable Chris’s chair to get in and out of the truck. It will then come back to PA.
Once back in PA the joystick hand controls (most likely an EMC joystick) will be put in. This is mainly the part that requires the bidding process since there are a few companies in PA that do hand control installs. We’re hoping to work with Ride-Away in Norristown. We’ve seen a good bit of their work and have been pleased with it. After all the work is complete Chris will have to be evaluated on the vehicle again to make sure it is fitted well for him and he can drive it safely (third hoop of red tape). We then sign the contract stating he’s not eligible for another vehicle conversion for 10 years. That is one of the major reasons we chose a truck. The durability of a truck cannot be matched by a minivan and we like to get out there and use our vehicle quite a bit! When all is said and done the truck will have probably $50,000 worth of equipment added to it! Easily making the vehicle worth around $100,000 even before Chris gets his hands on it! Yep it will be worth more than our house! We may still have 4-6 months before the truck is ready for Chris but we can’t wait to share the good news when Chris is driving himself! We’ve hit a little set back right now with Chris’s chair that is pushing our timeline for the truck back maybe a little bit. He was hoping to get in touch with OVR at the beginning of the year but over the holidays his new chair (less than 6 months old) had a major electrical breakdown. It has already been 4 weeks and we are still waiting for insurance approval to have it fixed. The chair went down after a little bit of water got into one of the chair mechanisms, specifically they believe it was the tilt and it fried the electronics. It has gotten wet before and just caused temporary errors. This time it didn’t come back. We went to a family Christmas party and it was lightly misting. It was covered even the part that got damaged. I’m still not sure how the rain got in but that is one of the problems with the current carrier system we are using with our current vehicle. The chair is out in the elements and even with a cover we can’t be sure it is completely protected. Chris was then using his old power chair to get around the house and we were using his manual chair for work and outings again but now even his backup power chair broke down (it was on it’s last leg too and they will not fix an old chair. That one has an electrical issue as well.) We’ve become temporarily limited again for our everyday activities because of not having his power chair. Trying to get out while having to push Chris and keeping two 4 year olds safe is very challenging. Both of our boys have developmental delays that cause impulsive behavior and they don’t think about straying from us no matter how many times we correct them and explain the how’s and why’s they need to stay with us. We’re working on it but it is so much more challenging when I’m needed to push Chris and keep both of them with us. When Chris has his power chair he can help to chase down one of them if need be. He is also temporarily off work due to having to use his manual chair constantly right now. He’s in a considerable amount of pain in his left hip because he cannot move himself as effectively to get comfortable. He doesn’t have the ability to change the angle he’s sitting in with the push of a button. Think about if you had to sit in the same position for 8 hours plus being essentially unable to change it. You wouldn’t be very comfortable so he is home right now so that I can help change his position and move him from his chair to bed as needed. The other set backs with him not having his chair means he can’t call OVR and get the hand control evaluation he needs. He needs the evaluation to determine the best hand controls for him which means he needs his chair so they can properly determine the equipment that will work for him and with his chair. 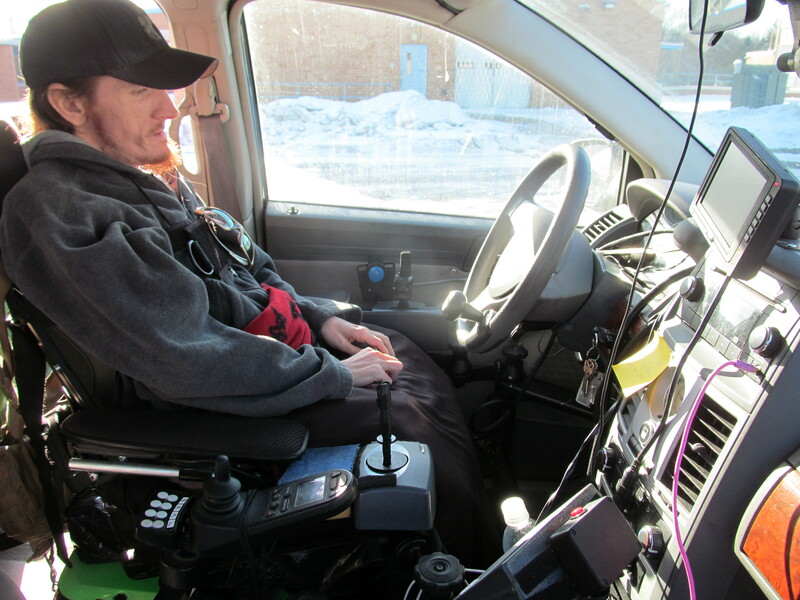 Getting the driving evaluation will be the first step in getting the truck and it can’t be done without his chair. He doesn’t want to get set up and then not have his chair to be evaluated.